Update: I added a supply list to the end of this post for anyone interested in what products I like to use. Please note, the Amazon links ARE affiliate links and if you chose to shop with me, I send you a big hug and thank you for supporting this blog. I linked a few non-affiliate links, also to finish up with list. 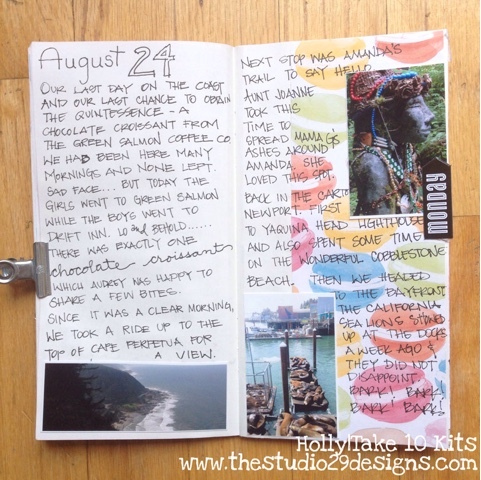 When we went to Oregon at the end of August, I brought along my first Midori Traveler's Notebook. I'm going to share what I packed and what I learned. For starters, it totally depends on the type of vacation you are going on. We typically take our three kids (currently 6, 4 and 2), so we are always moving and pretty active. That means, I keep it pretty simple. My goal is to WRITE IT DOWN! All the cute stories, things we did, funny things said go in my notebook. My second BIGGER PICTURE GOAL is to have something when I get back home to build on. It will become my mini-album of our vacation and I don't have to rewrite the journaling. I ordered a standard Midori insert with blank pages. I downloaded the August Daisydori printable that Cocoa Daisy offers. Currently, I believe they only offer a high quality printed version in the standard size. 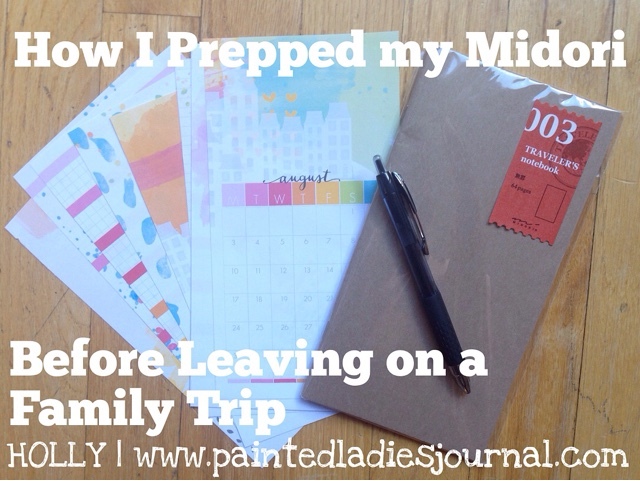 (This might be the way to go, if you can get it in time for your trip!) See it here at the Cocoa Daisy website. 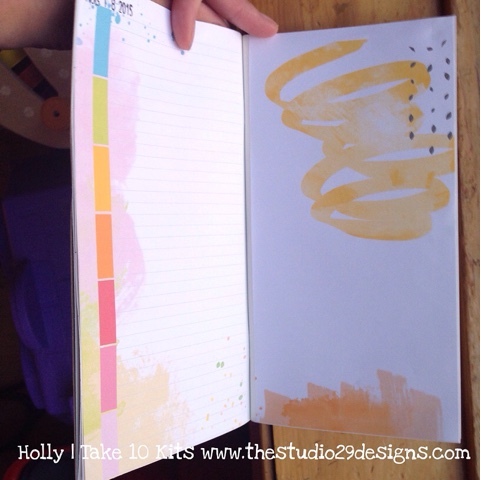 Otherwise dip into your paper stash, cut some down to size and use that! I also brought along my favorite pen (currently a black Signo). 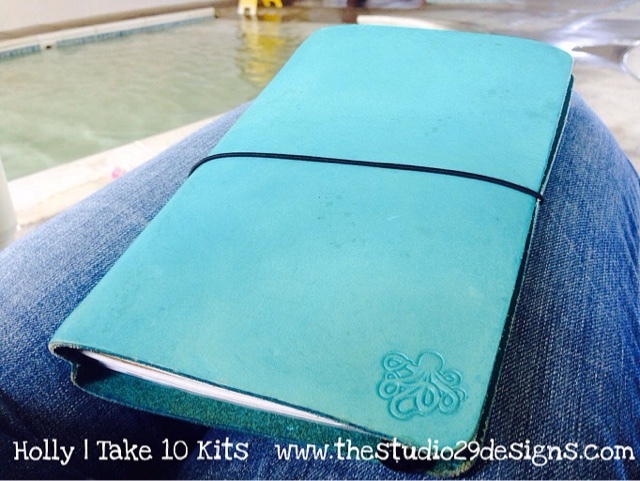 Now, I also packed my August Take 10 Kit, stamps, ink, adhesive, scissors; aaaaand I used none of that. If you know you will have lots of downtime, go for it. I printed the Daisydori and pasted pages right into my notebook, purposely leaving blank pages here and there for more photos. I had these Mambi Sticks that were perfect! 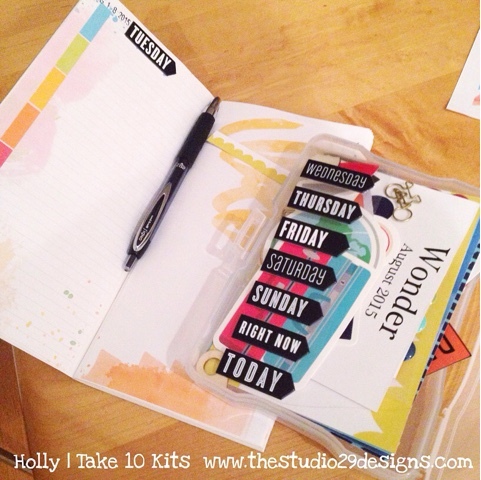 I packed those and did use them as as journaled, to mark what day it was. I pre-stamped the second page to set up a quick summary page to help myself keep the days straight. This was a life saver. We swam every afternoon, if I wasn't in the pool, I was sitting on the side writing. If not then, I tried to catch-up in the evening. I always packed it, in case I had some time to write. I had fun with doodling and different handwriting, to let something stand out. For instance, a great kid quote or the name of a place we visited. 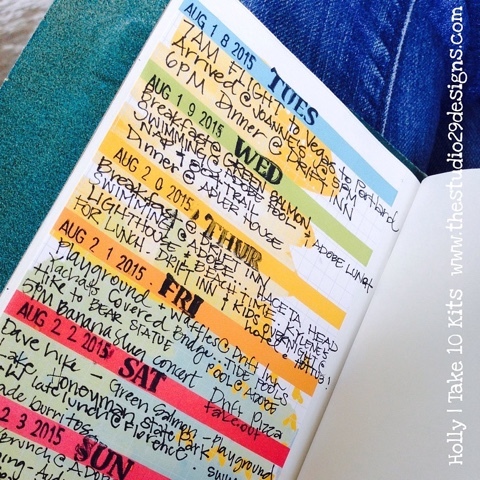 I hope this helps and inspires you to pack a Traveler's notebook on your next trip! I love the size. It's perfect to on-the-go! I just ordered this one to add to my collection I am starting. I'll come back later with a review after I get it. It comes with lots of extras that I also wanted. Midori Standard Insert - These are blank on the inside like mine. 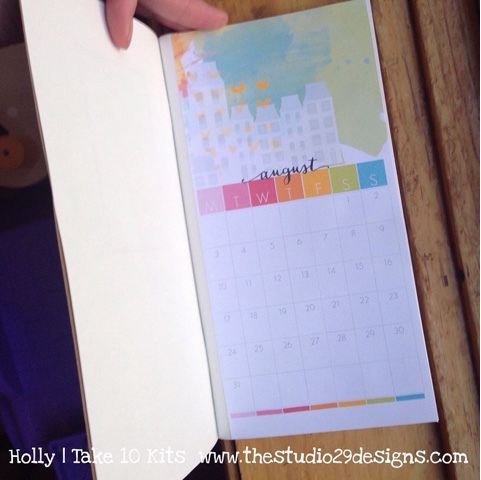 Midori Standard Insert - with grid. I also love these. 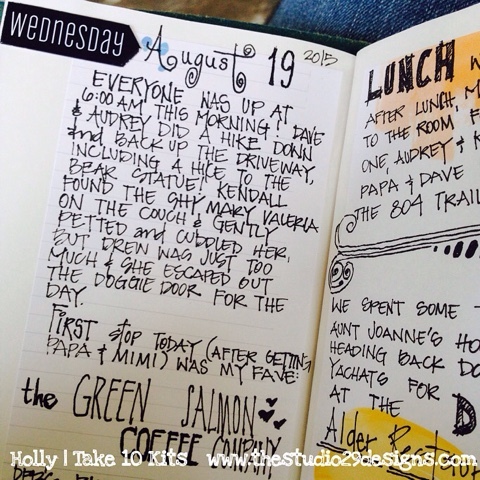 Black Signo Pen - my favorite journaling pen. Iris Case for holding your supplies while traveling. I like to buy a set of them for keeping different kits together.